Every April, Florida participates in the national Child Abuse Prevention Month campaign. The initiative is an effort to protect Florida's most precious citizens: the children. Florida celebrates with local events, promotions, social media and partnerships, but the most visible aspect are the many, many blue pinwheel gardens that glisten throughout the Sunshine State. 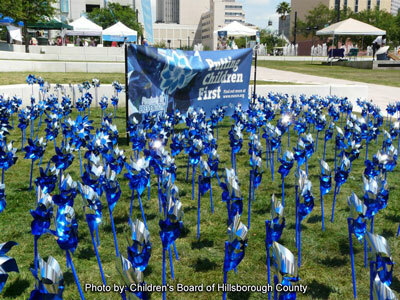 Plant a garden of beautiful blue pinwheels to show everyone you are an advocate for children. Download our FREE Parenting Guide e-book. It has great info to help parents from birth through the teenage years. You can also find more information at the The Ounce of Prevention.